We hope you enjoy our new site as much as we do. Feel free to browse our catalogue, enjoy the tutorials and see the events where we will be. In our catalogue you will find an extensive range of lace threads, craft and sewing accessories and books among other wonderful things. Please feel free to browse and look at the variety of products we have. Bienvenue sur notre nouveau site Web pour vous nos clients français. 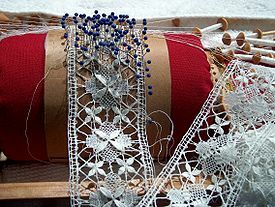 Nous avons un grand choix de fils pour la dentelle, point de croix, broderie, crochet, hardanger et bien plus. Nous avons aussi tous vos accessoires de dentelle dont vous auriez besoin. 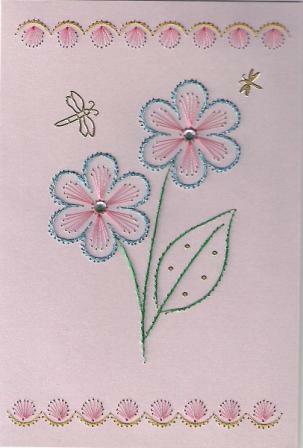 We sell everything you will need to enjoy Card Embroidery and even have a tutorial page if needed. For inspirational ideas and beginner guides we have a selection of Card Embroidery books. To get started we have Double Folded Cards and a wonderful selection of threads like Alcazar and Reflecta. We have all your accessories including your pricking mat, pricking tools such as pin vices and needles. Gavand Lace & Crafts has been supplying all of our customers with fantastic Lace and Craft supplies for over 17 years. We hope you will enjoy our website and catalogue as much as we do and hope you find all you are looking for. If you cannot find what you require please contact us and we will be delighted to help. Our catalogue is constantly being reviewed and we will be adding to it regularly. 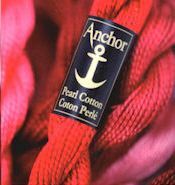 Please feel free to browse and look at the variety of products we have.